The best use for garden tomatoes is the never ending spaghetti sauce. Saute an onion in a little bit of olive oil. When it gets soft add a couple cloves of garlic and saute for thirty seconds. 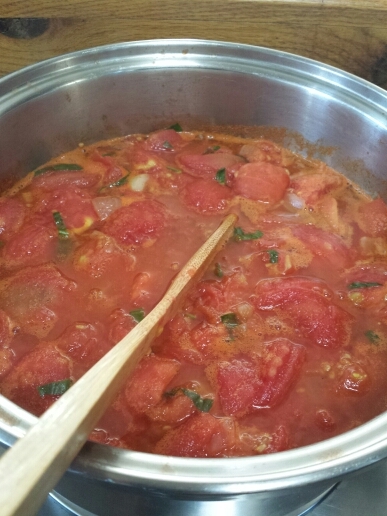 Then add roughly chopped tomatoes to taste and some bay leaves. At this time of year I cook all of the tomatoes that I picked. Simmer for a long time to intensify the flavor. When you have the tomato flavor where you want it you can add some freshly cut basil, a pinch of red pepper flakes, freshly ground pepper, and salt to taste. At this time of the year I cook up new batches every week and add the leftover sauce to the new batch. My plan is to freeze a portion if I get too much sauce. ← Is CNN’s Journalistic Integrity At Stake?